Aluminum or Fiberglass? What You Need to Know When Buying Your Next Bass Boat. Buying a Bass Boat: Aluminum vs. Fiberglass? Buying your first or next bass fishing boat can be a difficult decision with a lot of variables to pay close attention to. After you set your heart on a new boat you’ll need to decide how, where and with who you’ll use it. After running those ideas through your head you’ll probably look to factors like reputation, fishability, durability and cost of ownership. But one of the biggest decisions you’ll have to make might be the most difficult: Aluminum or Fiberglass? While fiberglass boats have long enjoyed a reputation as the go-to choice of serious tournament bass anglers, there are serious cracks in the perception that an aluminum boat isn’t up to the same ride quality, fit and finish and high performance of their fiberglass counterparts. Today’s advanced construction techniques and extreme durability have taken the aluminum vs fiberglass conversation to the next level. The aluminum bass boats available today are wider, more stable and offer more creature comforts than ever before. Just ask Crestliner Pro John Cox, whose 2016 FLW Cup win in a Crestliner PT 20 sent a strong message to the world: aluminum boats can compete at the highest levels in fishing. Crestliner bass boats shine as an example of what’s possible in an all-welded aluminum boat. With a wide, stable beam, wood-free construction and tournament-level fishing features, the PT 20 competes head-to-head with more expensive fiberglass boats and is engineered for maximum durability to get you to places others boats wouldn’t dare to go. The truth is, you’re not buying any less of a boat when you choose aluminum—there are boats for every budget and preference, including fiberglass. What you’re buying with aluminum is a different boat owning experience altogether. The biggest difference between today’s aluminum and fiberglass boats is the inherent properties of the material. Aluminum can bend, but it won’t crack. The premium aluminum construction of a Crestliner makes our hulls extremely difficult to sideline. That specific benefit of aluminum gives owners tremendous peace of mind that will last from one owner to the next. That extreme strength translates into durability that helps you routinely beach and battle the biggest waters without a second thought. Because fiberglass is woven with resin it’s naturally susceptible to breaking down over time. When not properly maintained, fiberglass can require costly patching and repairs to maintain its integrity and durability. Aluminum boats are also generally lighter, which means you get greater power-to-weight with the same HP engine. Although the power-to-weight ratio is dependent on specific models, when compared for purchasing sake, the lighter weight of aluminum can be an advantage for getting on plane and grabbing the holeshot. Lighter also means greater fuel efficiency when towing and running, and who would argue with saving a few dollars at the pump? When it comes to ride quality, aluminum boats like the PT 20 can compete with anything on the water. It features a Mod-V hull that provides instant planing, precision handling and a smoother ride than ever before. Adding to the ride quality is a wide beam that keeps the hull very stable when trolling. Concerning noisy aluminum rides: not a concern anymore. Today’s integrated stringer systems combined with an exceptional fit and finish on the deck dampen the chatter of high-speed riding. Fact: fishing electronics and technology are becoming an even more critical component to any effective tournament anglers’ approach. And the PT 20 is well-equipped for that task from bow to stern. Up front, it features a bow control panel with space for 7” flush mount electronics. From the driver’s seat, anglers interface with a premium console design featuring a detailed instrument panel and space for 10" x 8.5” flush mount electronics. From the transom you can easily mount a shallow water anchor for dropping and locking your boat in position when working a specific spot. Combined, these innovative features create a strong case for aluminum in tournament fields dominated by fiberglass. When it comes to aluminum bass boats, Crestliner is ready to keep you one step ahead. 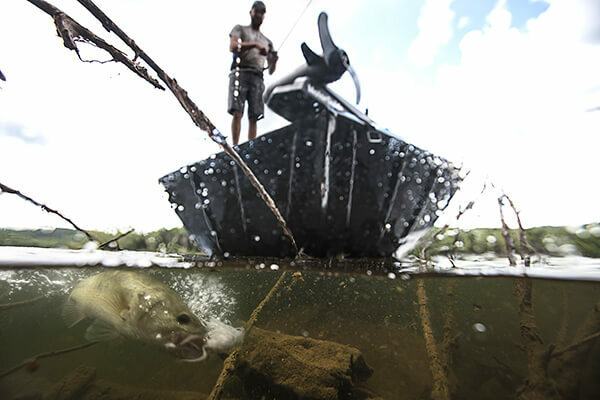 There is no doubt that fiberglass boats have earned their place among bass anglers. 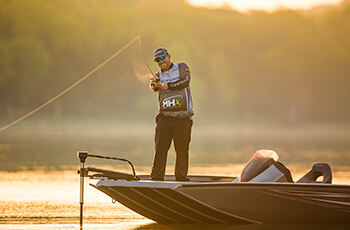 Spotlight endorsements and years of winning tournaments cemented a strong reputation among die-hard bass anglers. Today’s bass boat buyer can find their edge by seriously considering aluminum as an affordable alternative to the fiberglass boat owning experience. If you’re ready for a bass fishing boat that gives you more of everything that makes ownership easier at a fraction of the price of a fiberglass boat, don’t overlook Crestliner’s aluminum bass boats.